As the world’s travel technology leader, we know the energy and foresight required to thrive in this kinetic, relentless travel industry. It takes keen insight and personalization, paired with speed and scale, to maximize your share of the traveler’s wallet. And finding the balance between standardization and optimization is essential. 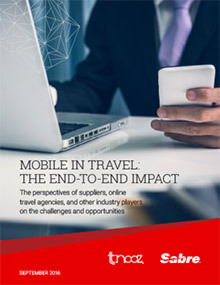 At Sabre, we have the solutions, so online travel agencies can flourish in these demanding conditions. We specialize in taking the complex and making it accessible and actionable. Together with you, we can leverage decision analytics, advanced personalization and our unmatched industry background to help you drive efficiencies. With our highly automated, touchless processing – plus the most extensive travel tech experience in the field – we help you keep your stakeholders happy at every step of the journey.